It's almost as if someone standing on the stairs there could have avoided death, the stairs are essentially intact. Mind-blowing. I'm not sure this proves demolition by itself, but I think this intact stairwell tends to support the idea of demolition more than collapse-- as a straight-down collapse of that whole tower wouldn't have left this section alone, whereas you could imagine with demolition, the core sections above this core section would have been blown away before they fell straight down to smash this remaining section. At the Change.gov website, there is a good number of questions on asking the Obama admin. 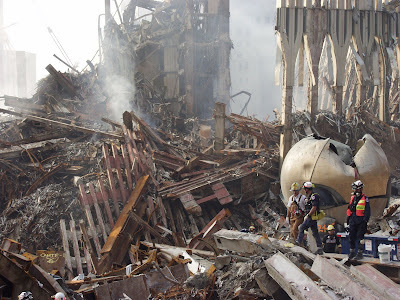 to investigate the WTC demolitions and about 9/11 being an inside job. Today is the last chance to vote, if you have a desire to do let them know your concerns on these issues. The remnants of the RCA Dome in Indianapolis. The 4 story structure was imploded Dec. 20th with 875 explosive charges. Note how little compaction of the debris there is and the large sections of structure remaining. Note the large chunks of concrete and large pieces of structure. Obviously, the RCA Dome and the WTC were very different types of structures, and most of the WTC debris fell further before it hit the ground. But officially, the RCA Dome was blown up, and officially the WTC collapsed on itself without explosives. 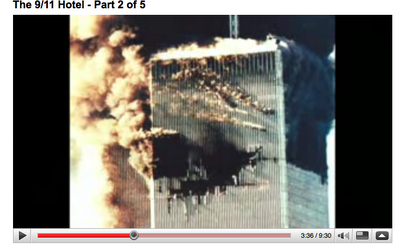 Yet, the WTC looks much more like the result of a explosive demolition! Of course, this is more evidence of the nuking. I'm sure you are really teaching those nasty Arabs a lesson this time. I'm sure they'll be much better behaved from now on. UPDATE: Israel is out of control, and the US will not do anything. Now all they need to do is be able to say "nukes". Although, the Hezarkhani Ghostplane shot is the original "ghostplane"-- I think this Luc Courchesne video is an even better ghostplane. COVINA, Calif. – A ninth body was found Friday morning at the charred site of a Christmas Eve massacre where a recently divorced man dressed as Santa shot indiscriminately at partygoers and destroyed his former in-laws' house with a homemade blowtorch. The attacker, Bruce Pardo, reached a Dec. 18 settlement with his ex-wife, who along with her parents was believed to be among the dead. His lawyer and a fellow church usher were among those who said they had never seen anything to indicate he was capable of such a brutal crime. Pardo's attorney, Stanley Silver, said his client seemed cheerful when he left a message two days before the shooting and was trying to pay $10,000 to finalize the divorce proceedings. "All of my dealings with him were always pleasant and cheerful," Silver said. "I'd never encountered him when he was ... angry or unpleasant at all." Pardo left the scene of the killings and was found dead Thursday, of a single bullet to the head, at his brother's house. A great playwright, but for our purposes here, he was mostly notable for his incredible speech against US foreign policy in his 2005 Nobel acceptance speech. What If Soldiers Didn't Fight? The WWI "Christmas Truce"
The Christmas Truce, which occurred primarily between the British and German soldiers along the Western Front in December 1914, is an event the official histories of the "Great War" leave out, and the Orwellian historians hide from the public. Stanley Weintraub has broken through this barrier of silence and written a moving account of this significant event by compiling letters sent home from the front, as well as diaries of the soldiers involved. His book is entitled Silent Night: The Story of the World War I Christmas Truce. The book contains many pictures of the actual events showing the opposing forces mixing and celebrating together that first Christmas of the war. I've never had a video removed before, though I haven't put so many videos on Youtube. But what seems odd about this copyright claim is that it is from Spell herself, not from the company that put out the DVD (Starz/Anchor Bay). How exactly does Spell get google/Youtube to act on this copyright claim anyway, as a presumably private citizen? Do people normally get copyright claims over their interviews? And what was the problem anyway? I didn't say anything negative about her in the video. It was just clips of her talking. Here's my most recent post on Spell. It's worth watching, mostly for the story of how some people escaped from the remnants of the hotel that was shredded by debris falling from WTC1 and WTC2. 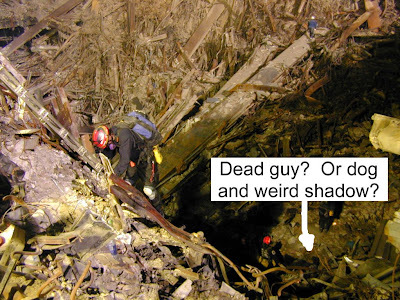 The story of the guys who survived and escaped from a small section of the 19th floor that wasn't creamed by WTC2 debris is amazing. 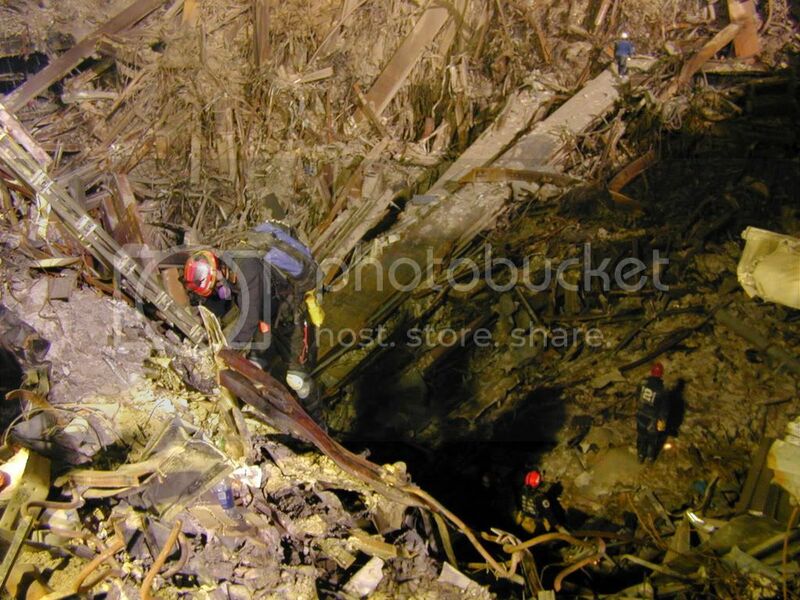 These were supposedly the only people who survived being directly under the falling debris of both WTC1 and WTC2. There's lots of good shots of the hotel at pre-attack and at various stages on 9/11, and they have a computer model of the hotel in its various stages of destruction. 1) the first seconds of part 2 refers to a woman who was burned (not clear how, though there is some allusion to jet fuel) being in the lobby of the hotel. What on earth was she doing there-- and why wasn't there more of an attempt to get medical attention for her? It's very odd. She eventually gets to a hospital and dies (40 days later). A.P. wonders if she was exposed to effects from a nuke (e.g. thermal rays), a la Felipe David. 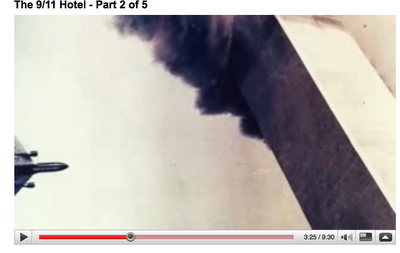 2) there is no mention of the plane engine that supposedly crashed into the hotel pool after the WTC1 crash. This is an odd omission, particularly as they even talk about the pool early on, and show a picture of it, in describing the hotel. So the engine in the pool story is likely apocryphal; not surprising if no plane hit the towers. 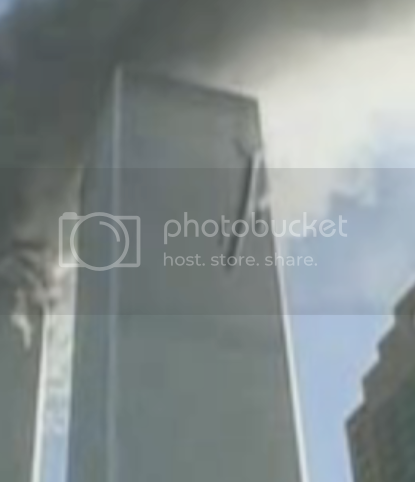 The first problem is that the vantage point for these pictures is miles apart-- the top pic is from maybe a half mile south of the WTC, the second one is from a few miles north of the WTC-- possibly from a helicpter! The bigger problem is that the plane picture is the same freaking photo as the Rob Howard photo of the 2nd plane that was used by Popular Mechanics-- a photo that is certainly a fraud, but clearly can't be the same picture taken by this woman's daughter. The fact that the producers of the film would put in such a whopping lie casts serious doubt on the whole documentary. Being a British film, it's quite possible this show was heavily influenced by-- or even completely controlled by-- MI-5/MI-6. Cheney: 33 detainees suffered 'enhanced interrogation'. 33, of course, is code for the evil PTB. "I think there were a total of about 33 who were subjected to enhanced interrogation...". 33 is not normally a number you would round off to, and if you weren't sure of the number, you would give a range-- e.g. 30-35. Is All the Mass Killing Due To Genetics, Learned Behavior, or Control By Others? Copyright, December 12, 2008 by the Anonymous Physicist. Permission granted for all to re-transmit, post, etc as long as it is non-profit and “Copyright, Anonymous Physicist” remains on it. All other rights reserved. Mankind’s recorded history can be summarized as a collection of wars, exterminations, crusades, etc. Many have asked why there has been-- and is-- so much killing, evil, and seeming chaos. Many treatises, written by scholars and others, have attempted to answer this question. The field even has a name-- ponerology-- for the study of evil or injustice. However nearly all these works were written from the standpoint of sociology, superficial politics, economics, philosophy, psychology, or religion. These bases, and their authors, are in fact ignorant of the most crucial elements needed to accurately answer this perhaps most important question. I also believe that many of these treatises on evil are deliberate disinformation, as the actual Powers That Be (PTB) can ill afford to have the real answer to this question revealed to Mankind, else a revolt might ensue. A corollary to this issue, that is also often asked about, is how is it that Man has advanced technology and physical science, yet at this same time, his collective behavior is still so barbaric? Let us examine some of the previous ponerological theories. Some can be dismissed because their basis is devoid of reality, such as the ones based on “God,” the “Devil,” or simplistic views of “Good vs. Evil.” Religion, however, has been used as an excuse for wars and crusades and the like. Similarly, nationalism has also been such an excuse. In fact, the two concepts of “God and Country” seem to invariably lead to the “thinking” that “everyone’s is better than everyone else’s.” (Exemplified by the Nazis’ motto: “Deutschland über alles” or “Germany over everyone”.) The issue of race or ethnicity is also used similarly. But have these concepts led to the wars and mass murders in a chaotic, random, or “natural” way? Or have the ideas of race, religion, and country been cleverly used in covert fashion to control Mankind, and to get him to mass murder himself? This is actually the case, as Germans (previously) got along mostly well with those the Nazi regime ended up exterminating-- Jews, Gypsies/Romani, Slavs, etc. And for the most part, so did Hutus and Tutsis, in Rwanda. The larger, hidden question is-- were all these different races, religions, nationalities created with the idea of perennial war and mass killing in mind? Some theories on evil may have an element of truth in them, such as the psychological basis of evil. These proponents say that psychopaths/sociopaths exist in a certain percentage of the human population, and due to their nature and cleverness, they rise to the top. They then have the power to commit mass murder senselessly (because they are psychopaths). The element of truth is that the (seeming) heads of state that have their country commit mass murder probably are devoid of conscience, and are sociopathic. But the knowledge of Ultimate Truths reveals that these supposed sociopathic leaders are EMPLACED in powerful positions with the aid of secret societies that control governments. The subsequent “evil deeds” performed by such leaders are, in fact, scripted for them to perform, by the actual PTB; and the sociopath/psychopath theory fails. Similarly there are those who will say that these horrible mass killings are due to the nature of Man (or some men). Some throw in their hidden racism here. Einstein said Germans were evil to their core-- and should be nuked; others say the Rwandan massacre occurred because “those primitive black people do those kinds of things,” etc. But this “thinking” also fails because we have learned that the Nazi regime was implanted and controlled by the English PTB, and that “Hitler was a British agent.” Likewise, recent revelations on the Rwandan Genocide show that both the missile shoot-down of their President that started the killing, and the subsequent killing itself, were controlled or facilitated by European powers and the USA. Let us briefly look into the modern barbarism of Man, say during the last 200 years. This period is marked by the greatest wholesale killing in Man’s “official” recorded history. We have had the many millions killed in the two World Wars, and the many, so-called local wars (Korea, Vietnam, Afghanistan, Iraq, many others). We have also seen several mass famines that have been revealed to have been artificially created by governments. This includes the so-called Irish “potato famine” of the 1850's, and the famine in the USSR in the 1930’s. The Irish famine should more appropriately be called the British-created Irish Holocaust, as England took all the livestock and grain from Ireland and left mostly just potatoes, which then had a blight, which itself may have been induced. 5.5 million people are said to have died. And the British propaganda machine is so good that few, beyond the Irish, know that this was a deliberate act by the English regime. However, the country with the greatest propaganda machine is the USA. Recently a Russian researcher demonstrated, via America’s own census statistics, that 7 million Americans likely died of starvation during the Great Depression of the 1930’s, and also showed that much food was thrown out during this time. This research appears to be valid and true, though few Americans know this or would believe it-- their brainwashing being so thorough that they think their regime is variously near-perfect, or innocently inept, when horrendous crimes are committed (by their regime) against the people. The USSR also had a mass famine in the 1930’s that was deliberately created by its regime-- tens of millions may have died. Likewise the Chinese Communist regime also is said to have killed tens of millions in its famine that occurred after it came to power. Even in today’s world, millions are starving in “Third World” countries in Africa and Asia-- all the while there are so many millionaires and billionaires on the planet. Fake, controlled famines have been covert forms of extermination, or holocausts. That likely remains the case to this day-- in Somalia, Ethiopia and other countries. Famine has a long and sordid history. If the recent ones (Ireland, USSR, USA, China) are known to have been created by the Covert Ops of Govt’s, maybe many of the famines from long ago were as well. Then there have been the more obvious exterminations/genocides including the Armenian Holocaust, of the early 20th Century, perpetrated (and still denied) by the Turkish Gov’t-- killing some 1.5 million Armenians, the Nazi extermination of some 13 million people in death camps-- including Jews, Gypsies, Slavs, homosexuals, alleged retardates, political prisoners, captured “enemy combatants,” the Cambodian Genocide that killed 1.7 million people, the Rwandan Genocide whereby nearly one million Tutsis were killed by Hutus, and the ongoing Congo massacre whereby 5.4 million people have been said to have been killed in the last few years. A history of modern genocide is here. One aspect of the issue of Man’s alleged evil nature is rarely, if ever addressed. This is the wholesale poisoning of Mankind, and its affect on the brain and behavior of Mankind. Man’s food, water, and air (smog, chemtrails) are ever more poisoned. Our medicines are toxic and may be causing more harm than good, our dental fillings are called “silver” yet are over half mercury, likewise our infants are forced to have vaccinations also with mercury and other toxins. The proven carcinogen fluoride is added to water and is in many medicines, and toothpastes. The German Nazi regime is said to have fluoridated water because it made people docile. Is the same rationale ongoing in the USA? In a ludicrous “environmental” change, incandescent bulbs are soon to be phased out and replaced with more efficient fluorescent bulbs that all have mercury within them?! All the toxins in the food, water, air, medicines, fillings, vaccines have a terrible effect on people’s brains. Few people can truly think and change, or have the courage to act. These toxins also cause much chronic, degenerative illness, cancer, etc. The mercury in vaccines does cause autism. Many people are made into nervous, or depressed, automatons by their addictions to caffeine, nicotine or alcohol. Even excess sugar can have this effect. Few people know that humans actually become addicted to things that are toxic or allergenic for them. This is the so-called allergy-addiction syndrome. Even common foods like wheat and cow’s milk products cause much mental and physical illness in some people. Dairy and wheat have only been consumed by Man for 5,000- 10,000 years; and is said to coincide with the onset of some mental illnesses. Studies have found that violent, convicted criminals’ behaviors were changed and improved after improving their diet. The same is true of learning disorders in children. It is vastly easier to control Mankind if he is in a stupefied, nervous, fearful, state. Others may be more likely to experience anger and be willing to kill and die, if loaded up on these toxic elements. So we must ask, how many of the evil acts performed by people are facilitated by Man’s wholesale poisoning? 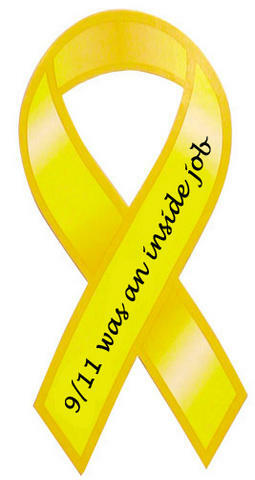 And we should not forget how some individuals were/are massively poisoned for exposing the real nature of the PTB. When Man, or the people of a certain country, commits acts of great evil, does it support a nature or nurture basis? One area that has received much study is the Nazi Holocaust. (One hopes that future studies will be undertaken on American soldiers’ often-heinous behavior in Vietnam, Iraq and Afghanistan, as well as ALL other nations, Israel included, whose policies are also barbaric towards the people they control.) Now the capture and trial of Adolf Eichmann led to both the book [not read here], “Eichmann in Jerusalem: A Report on the Banality of Evil” and the Milgram Psychology Experiments. The Milgram Experiments should be read by all; they were a set of controlled, scientific experiments that demonstrated that about 65% of people will obey an authority figure and administer electric shock to people when asked to-- even when the person supposedly receiving the shocks is screaming and begging for it to stop. Indeed many continued to supposedly administer the shocks even after one recipient-- a supposed heart patient-- feigned non-responsiveness. It is important to realize that the 65% authority-obedience rate occurred when the subjects were not at any risk if they refused to shock the other person. When civilians or military personnel are under threat of arrest or court martial for disobeying, the percentage of Mankind that will commit acts of torture or murder will likely be significantly higher. It is indeed a sobering thought that most of your friends, neighbors, and everyone else, will mindlessly obey and torture and kill you, even if you are innocent of any wrongdoing, if “the authorities” ask or demand this! But this knowledge then causes us to ask if there are any factors that have lead to such blind obedience to authority in most people. The wholesale poisoning of Mankind-- and thus his/her brain/mind-- was already discussed. But a knowledge of Ultimate Truths (see below) dictates that we must ask if this is a genetic weakness; i.e., was Man designed to have such brain/behavioral defects, by his evil creators? Or can the Milgram blind obedience results be, at least in part, a learned behavior? Is it a deliberately induced behavior, by the PTB? Has the 65% obedience rate been duplicated in other countries and societies? And how is it that 1/3 of the subjects did not show this potentially grave defect-- that can lead to either partaking in evil, or not trying to counter one’s gov’t from committing evil acts? And what can be done to get the other 2/3 to give up this harmful blind obedience to authority figures? This may be both the most crucial and the most practical question to ask. We should not shrink from the (horrific) implication that the Milgram Experiments indicate that there may literally be millions or billions of potential, order-obeying Eichmann’s among the human race! Perhaps it is very telling that Govt’s have not acted to try to counter this dangerous, deadly blind-obedience to authority-- indicating their hand in creating it. In conclusion, the Milgram Experiments alone are insufficient to answer the deeper questions in this article. But these experiments do show that many people have a dangerous capacity of great obedience to authority. If the ultimate authorities, on this Planet, are immensely evil, we could end up with the horrific events that comprise much of Man’s history. On the other hand, if the ultimate authorities were good, people would follow them and our history might have been very different. I now have some final thoughts on both the Milgram experiments, and on Eichmann’s trial on charges of Genocide, and Crimes Against Humanity. Eichmann’s trial judges and later Supreme Court (Appeal) judges did not adjudicate this matter lightly. They wanted to be fair, and to look fair, as they knew innocent Jews in other lands might lose their lives as a retaliation for their verdict-- which turned out to be the case in Argentina, and elsewhere. Nonetheless, their guilty verdict, like the Nuremberg Tribunal guilty verdicts, obviated the “following orders,” or blind obedience to authority “excuse”, that 65% of Man may have inherent (or learned) in his/her nature. One 1945 quote from Eichmann may have helped convict him. He said, "I will leap into my grave laughing because the feeling that I have five million human beings on my conscience is for me a source of extraordinary satisfaction.” [Eichmann had meticulously tallied the numbers of those transported/killed under his command. It was both a significant bureaucratic accomplishment, and apparently a source of personal satisfaction for him.] Wiki quotes Eichmann’s counter, at his trial. He claimed that he was referring only to "enemies of the Reich [Gov’t]" in that quote. Notice first that at a trial for his life, when confronted with his own statement to a former “colleague”, he did NOT deny his personal involvement in killing 5 million human beings/Jews. [Something that also needs to be realized by those in the conspiracy field when they see someone, or some website, claiming either that it never happened, or the number of victims was vastly smaller.] Apparently if Eichmann’s Gov’t declared certain human beings to be “enemies of the state,” he then had no qualms on murdering them en masse. His last words (above), indicate that a state of war having been declared by his Govt, further-- in his mind-- legitimized mass murder of the people his regime had declared to be enemies. This ”logic” of declaring a war, has been used by many regimes-- notably the American one for some time, and especially after 9/11/01-- to attempt to validate (for the masses) its mass murder of innocents. Sadly I assert that Eichmann’s view of one’s Gov’t as an entity that must always be blindly, and even gleefully, obeyed is actually held now by many-- perhaps a significant majority [in agreement with Milgram]-- of those, in the USA, that either work for, or otherwise benefit from, or have benefited-- or believe that they have-- from the American Federal Government. The Israeli judges, in Jerusalem, like the earlier Nuremberg Tribunal Judges, declared that obeying authorities, or even your Gov’t, is not a legal excuse for war, genocide, or mass killing of human beings. This judgment must be promulgated to all military personnel, and others who work for Gov’ts worldwide! In this light, the People of the world do indeed need to indict the top Americans who ordered the mass killing and torture of people in Iraq and Aghanistan, as well as the nearly 3,000 Americans killed by their own regime on 9/11, as the American regime’s bogus “Reichstag Fire” excuse to wage perennial war on Mankind. The fact that no other national gov’t has issued such an indictment against the top American military and civilian leaders, including Bush and Cheney, indicates again a global conspiracy against Mankind, and against the causes of Justice and Peace, and is a betrayal of the Nuremberg Principles. The precedent of the Eichmann affair of kidnap, trial and execution desperately needs to be repeated on the American rulers, or else the lessons from Nuremberg and Jerusalem, that serve to counter the defects in Man that were delineated by the Milgram Experiments, will be lost. This not happening again shows that all of Mankind’s gov’ts are under the control of immensely powerful and evil forces who are deadset against Justice and Peace for Mankind. A related book [read here] is “Hitler’s Willing Executioners: Ordinary Germans and the Holocaust.” The author depicts how many ordinary Germans submitted to mindless propaganda, and ended up committing the most dastardly of deeds. It helped end the claims that “few Germans knew,” or that especially sadistic men were selected to perform the sadistic deeds. Horrific acts of torture and murder are depicted, as well as the everyman nature of those who committed these acts. One remarkable fact revealed was that the Nazi SS allowed their soldiers who could not stand killing or torturing people, sometimes even infants, to get out of such duties without any penalty or mark on their records! The author found evidence that ONLY ONE OUT OF THOUSANDS OF SS MURDERERS ASKED FOR OTHER DUTIES! Most of these previously, average people apparently, mindlessly committed heinous acts on helpless innocent human beings TO THE VERY LAST MINUTE the war was to end. But is this none other than a manifestation of the Milgram Experiments’ obedience to authority results? Except here: 1. the authority figure is “THE GOVERNMENT,” and “THE MILITARY” not merely a researcher in a lab, and 2. here these former average people are directly torturing and killing innocent people, without any doubt, and 3. these people have received much, prior indoctrination. Does the Milgram 65% blind obedience go to 99% of humanity under these circumstances? The only alternative is the Einstein understanding that Germans are evil to their genes. I doubt that there is anything special about the German people in this regard. We only have to witness American troops in Iraq, when Iraq never attacked the United States. While it is not country-wide American policy to carry out extermination, each American soldier is there to potentially kill people that did NOTHING to his countrymen. Another fact demonstrated was that, contrary to what was claimed by the German people, millions knew about the extermination. The author shows how many were involved in transporting, guarding or other involvement with those to be exterminated. One major city ran a newspaper article freely admitting to it. The author lays blame on the Gov’t and the Catholic Church for their propaganda against those to be exterminated. All this is relevant to the American people’s complacency, as its regime targets alleged “Islamo-terrorists” and any nation on Earth, for the alleged act of the fictitious Al-CIA-duh’s 19 Arab “hijackers” destruction of the WTC. Not very many Americans are willing to investigate the fact that the plane impacts depict impossible crash Physics (and are thus merely CGI [Computer Generated Imagery] created for TV viewing by the masses), and thus did not take place; or that the great heat in the WTC rubble pile, for up to six months afterwards, virtually proves the American regime nuked its own people, and the China Syndrome resulted. Instead massive denial comes into play-- as it did with the Nazi takeover of Germany. All too many people seem happy to digest the propaganda/lies from their TVs, and conclude “America über alles,” rather than face the fact that their Gov’t is setting them up for total disaster, also like what happened in Nazi Germany. Germans still mostly do not know, or want to accept, that “Hitler was a British agent”. Likewise the Israeli regime’s often-heinous treatment of Palestinians is particularly odious coming from a people that were decimated by similar treatment so historically recently. Being a victim of genocide is no excuse for perpetrating it, or a slower version of it, on others! This appears also to be the case in the Congo, during the last decade; as the nearly exterminated Tutsis are allegedly involved in killing millions in the Congo. Rare minerals needed for electronic devices in the “civilized” nations is said to be the underlying reason for this mass murder. There is little doubt that the “hidden hand” of the PTB will ultimately again be uncovered for causing this extermination. One fascinating thing I have observed is that many people are uplifted by the heroic behavior of those who acted “humanely” to save innocent people from mass murder-- even though both history and the Milgram experiment shows most people will not act similarly. It seems that many are moved to learn about people who risked everything-- and sometimes paid the ultimate price for saving people who were “not their own,” except, of course, that such people view all people as their own. Most people know about Raoul Wallenberg, and Oskar Schindler and his wife Emilie-- who has not been given proper credit for her amazing heroic deeds. There have been numerous other people who acted similarly. But one such rescuer--an Italian man who ended up saving 5,000 people in Budapest--has had a book [not read here] written about him that has a title that is very relevant to this article. The book is called “The Banality Of Goodness: The Story of Giorgio Perlasca.” See also Wiki on this story. Note the author’s phrase, “The Banality of Goodness” as a title; because he- -in contradistinction to the Eichmann matter-- wanted to show that a very average person (up to that point in his life) could not help but do so much good for so many desperate, innocent people, when he found himself in a position to do these good deeds, and at great risk to himself. The “Banality of Goodness” aspect of Man’s nature brings me to some events, and depictions, of World War I. I assert that they may relate to the real nature of Mankind, if only s/he were allowed to be in control of him/herself. During the 1914 Christmas of WWI, French, Scottish and German troops near each other, in the trenches, briefly put down their weapons and celebrated Christmas together--for a night and a day--before being ordered to go back to killing each other. The recent film [seen here], “Joyeux Noel” depicted this. But in 1957, Stanley Kubrick’s great film [seen here], “Paths of Glory” was loosely based on this and other events of WWI. The ending of this movie is said to be one of the best and most moving scenes in cinema history. It is here on Youtube. It shows French troops jeering a frightened, captured, young German woman, as she is forced to sing for them. The reaction of the French troops to her innocence must be seen to comprehend the true nature of most people, if only their controlling “authorities” were not of such an evil nature that most people cannot even comprehend. I believe it shows what Man could be, if these “authorities” could be found and eliminated, and Man was left to himself. The earlier part of that movie is also loosely based on actual events. It shows, a top French General ordering French artillery to shell their own troops to help force them out of the trenches, and to attack “the enemy.” When that didn’t quite work out as planned, several Frenchmen are later scapegoated, and handpicked for bogus cowardice, and a firing squad. Near the end, in a move that rarely occurs in reality, that top French General himself is tried for the shelling of his own troops. This brings us to the foul deeds perpetrated on the foot soldiers in the trenches on the very last day of WWI. The American commander was General John J. Pershing. Wiki says, “He controversially ordered his troops to continue fighting after the Armistice was signed. This resulted in 3,500 US casualties [killed or seriously wounded] on the last day of the war, an act which was regarded as murder by several officers under his command.” While the German troops either retreated or defensively waited in place, till the “eleventh hour of the eleventh day of the eleventh month” for the Armistice to go into effect, Pershing (and subsequently, numerous subordinate, high-ranking officers) had given the order for American soldiers to charge the German lines-- lines that they would, in minutes, be able to casually walk across-- literally UNTIL THE VERY LAST MINUTE before the Armistice went into effect! Some French and British top Generals acted similarly. Pershing and other American Generals would lie to a Congressional hearing and get away with it, about these events, and just exactly when they had learned the Armistice was to go into effect. Pershing was REWARDED and promoted to be the first USA “General of the Armies” the next year, and “was the model for the top WWII Generals.” He was the only one to hold that 6-Star equivalent rank, until George Washington was posthumously awarded that rank in 1976. In 1961, Nuclear-tipped Intermediate Range Ballistic Missiles were (appropriately?) named after Pershing. Instead of being rewarded, Pershing should have been tried and convicted for the mass murder of his own troops, and for treason, and hung-- are you reading this, American servicemen and women? This is who commands you, and what their goals really are. Again the Pershing matter, and his remarkable reward-- instead of being hung-- shows that the evil in Man’s affairs, is due to the highest levels in his Gov’ts, and those that control these Gov’ts. In this light, we know what happened when America, and the world, finally got a true prince of peace-- President Kennedy. He refused to war against Laos, Vietnam, Cuba, or to do the “big one” during the Cuban Missile Crisis. He promised “not merely peace in our time but peace for all time.” Listen here. When the PTB felt threatened by his call to end war, and have Peace, they issued their “Report From The Iron Mountain” that heinously declared that war was necessary and good for Mankind. Kennedy ordered the return of the first 1,000 “advisors” from Vietnam (and thus begin the end of the Vietnam conflict before it ever got going); and that order was countermanded by the Joint Chiefs of Staff, just before he was assassinated. I have also revealed here that President Kennedy had found out that the President did not have actual control of the launch of America’s nuclear arsenal, and had attempted to wrest control of this from the military. All this indicates that the actual nature of Man’s governments is far from what is publicly portrayed. And that war, and other events-- on the grand scale-- are controlled by others, and forced upon Man. 9. all of the above can be explained ONLY by the fact of what I called the Cosmic Criminal Creators of Mankind trying to break through the Quarantine around the Earth in which they have been trapped for 50,000 years or more now. 10. Likewise, no species would endanger its entire existence by creating nuclear or biological (AIDS, Ebola, etc.) weapons of mass destruction that could get out of control and exterminate all of Mankind-- unless they never were under Man’s control! Indeed any one-- let alone all-- of the above matters, in itself, is probably sufficient to prove the case I am making here. E.g., the massive numbers of nuclear bombs and ICBMs being capable of (needlessly) wiping out all of Mankind several times over, demonstrates that nuking only the alleged “enemy” is not what they were intended for-- rather either Quarantine Escape, or the extermination of ALL of Mankind (including the country from which the nukes would be launched from) is the true intent of all the nukes and ICBMs, and other WMD, that exist on Earth. Furthermore, I have also demonstrated that all the “enemies” involved in the World Wars and Cold War were, behind the scenes, actually in cooperation with each other! All of this indicates that the evil perpetrated against Mankind does not, in fact, originate from Mankind! Rather the alleged evil actions of Mankind have always been ultimately dictated by Man’s Cosmic Criminal Creators quarantined down here. This is further indicated by the evidence (Sodom/Gomorrah and the Mahabharata/Kashmir) of several previous, possibly global, nuclear wars on Earth in the last tens of thousands of years. So the question of how could Man have advanced science and technology, yet still be backwards and barbaric in his behavior towards his own species is thus shown to be specious. The truth is that Mankind is totally controlled, and that all the science and technology he creates, or appears to create, as indicated here is to be used for the control and killing of Mankind, plus one other goal-- Quarantine escape. Everything that our alien criminal creators force Man to do is ultimately for the goal of breaking though the Quarantine/Grid/Bio-Net. And they have tightly controlled Mankind since they created us. Man has some of their DNA, which also prevents Man from passing through the Quarantine around the near-Earth Space. Thus the need to make poor, fake Moon Landing videos. But if we have some of their DNA (Man made in “god’s” image), and they are so evil as to create and then exterminate millions or billions of sentient beings-- as appears to have been perpetrated against either the present or previous species of Man (Cro Magnon Man, Neanderthal Man, or other)-- then Man himself could be inherently, extremely evil from this alien DNA. But again all the evidence and history indicates that when left to their own devices, most human beings just want Peace. And the immense efforts the PTB have to go through to brainwash, deceive, and control Man indicate again that without all this, Man would NOT be waging perennial war on himself. A cohesive picture, derived from all my articles, has demonstrated that all the wars, and WMD are either forced upon, or given to, Mankind for the SCRIPTED, forced mass murdering of himself, and for the related Quarantine escape. All other attempts to explain the nature of evil in man are thus shown to be either ignorant of the most crucial, and previously hidden (or denied) facts, or they are deliberate disinfo-- perhaps the final covert element in the scheme to hide the control of Man by the actual PTB. Man, like any other biological entity, is far from perfect; but Man’s behavior, or evil deeds-- on the grand scale-- have all been scripted for him, for countless generations. To summarize, I assert that the preponderance of the evidence indicates that the evil Man has done, and is doing today, on the macroscopic scale, is mostly due to Man's actions being dictated by extremely evil beings who created him, and have controlled him ever since. These controllers have had one goal in mind-- Quarantine escape. Both the nature and nuture (genetic and learned) aspects in Man's often evil behavior are superseded, in importance and causation, by the hidden truth of Mankind's total control, on the grand scale, by the alien criminals who created Man to be their slaves, 50,000 or more years ago; and who have held a tight and evil grip, over all Man's important affairs ever since. It is hoped that those in the intelligence agencies and the military, from soldier/seaman to General/Admiral, will find this knowledge, analyze it, see the crucial truth in it, and then utilize it when the time comes. Utilize this knowledge, to CEASE BEING GUTLESS AUTOMATON EICHMANNS, and do not kill innocent and good human beings. Rather ascertain where our Cosmic Criminal Creators are, and who their top, evil human lackeys are; and then do the right thing, in the NAME OF ALL HUMANITY-- WHICH IS ON THE WHOLE, A GOOD, NOT EVIL, SPECIES-- IF ONLY WE WERE LEFT ALONE. Mike Connell-- who knows what secrets went down with him. 21/2 miles of fuse wound through the dome. About 9:35 a.m. -- 30 minutes later than planned -- the blasts sounded and the ground shook. After about 20 seconds, 875 explosive devices reduced the four-story, 1-million-square-foot stadium to a pile of rubble. The collapsing walls resembled falling dominoes as they followed a preset pattern, leaving a massive ring of debris. After the dust cleared, a few jagged portions of the old concrete walls were still visible. That -- and virtually everything else during the implosion -- had been expected. "Everything looks really good," said Mark Loizeaux, president of Controlled Demolition. "I'm actually surprised the debris is as low as it is." On all four levels of the dome, crews had placed 610 pounds of nitroglycerin-based dynamite into pre-drilled holes in the supporting columns. More than 100 workers have been involved in the demolition process. In the hours after the implosion, work crews and safety personnel found no significant damage to area buildings. A piece of steel penetrated the wall of a storeroom at the Indiana Convention Center, Loizeaux said, but crews would quickly repair that, he said. Loizeaux, whose company is based near Baltimore, also oversaw demolition of Market Square Arena and, before that, four other Indianapolis buildings. "It's a little ironic that a demolition company from Baltimore had the opportunity to take down the stadium to where the Colts fled when they left Baltimore," said Loizeaux, a Baltimore Ravens fan. Demolishing the dome cost about $13 million, said Lori Dunlap, deputy director of the Indiana Stadium and Convention Building Authority. That figure includes some site preparation for the convention center expansion, she said. The total project, including the dome demolition, will cost $275 million. Today's "Tales of the CRIMINAL MEDIA"
I was listening to the Diane Rehm show yesterday, as I sometimes do when I think I feel patient enough to tolerate the lies in order to gain some sense of what crap they are talking about now. Thus, I got to hear some American journalist's tale of being in the news conference where the shoes were thrown at Bush. The guy was highly sanctimonious about the whole episode, and the panel was all so shocked that such as thing could happen. There was ABSOLUTELY ZERO comprehension expressed of why any Iraqi would be angry enough to throw shoes at Bush. And the panel was all so very relieved when they heard how the rest of the Iraqi journalists at the news conference were so embarrassed about the incident and apologized profusely. Nauseating! Also, Greenwald shows how the criminal media-- in this case Ruth Marcus-- can also be criminally stupid. The obvious solution is to cast a deeply suspicious eye on people who do make A LOT OF MONEY, particularly people such as Wall Street bankers who are not selling any useful product and simply move money around, because they are PROBABLY stealing a lot of the money. There are certainly more-or-less "legitimate" ways of making of lot of money. But in general, society needs to heavily scrutinize those who accumulate a lot of wealth-- NOT LIONIZE THEM! There's also another part of this accumulating/stealing money issue that has to do with deep conspiracy and the nature of evil. I will be posting a very important piece on evil from the Anonymous Physicist this weekend. Stayed tuned! Speaking of evil-- here is some highly disturbing evil manifesting as racism during the Katrina catastrophe in 2005. Outgoing Secretary of State Condoleezza Rice has acknowledged that she was responsible for the security failures that made possible the 9/11 attacks. However, she did so only fleetingly and in a backhanded manner before returning to justifications of her actions. "I do take responsibility -- but this was a systemic failure," Rice told CNN's Zain Verjee during an exit interview on Wednesday. 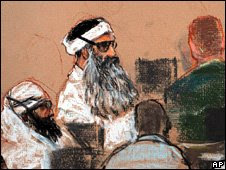 Verjee had begun pressing Rice with a question about whether she had ignored warnings of the forthcoming al Qaeda attack. "This is simply not true," Rice replied, saying that there had been only "a single item that said bin Ladin determined to attack – not when, where, how." Rice insisted the real cause of the failure was that "we did not have the capacity in our systems to share information between law enforcement, the intelligence agencies, and to be able to act in a very quick and decisive way." I've long wondered if she is evil or simply clueless. I think the answer is that she was clueless about what happened before 9/11-- though I may well be wrong. Clearly, Condi WAS evil in lying about WMD before the Iraq invasion. 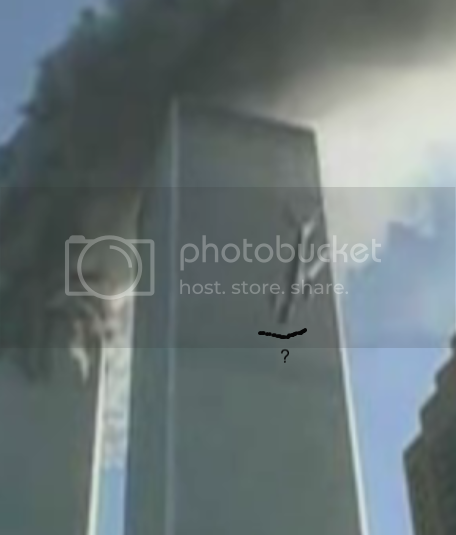 So she may well have known more about 9/11 beforehand. It is hard to see how the NATIONAL SECURITY ADVISOR would have had no idea that the military was running hijacking drills on 9/11, and also wouldn't have known that they had run drills beforehand of hijacked planes being run into the WTC and other high profile targets. Of course her infamous line that no one had ever anticipated that terrorists would use a plane as a missile was a complete lie. ZOMG! Obama Not Qualified to be President and Needs to be Removed! Though actually, in the grand scheme of things to get outraged about, I'm having trouble getting outraged about this-- even assuming it is a legitimate issue. How many of the last ten Presidential elections were essentially contests between the liberal and conservative wings of the CIA? Henceforth, the "mainstream media" will be referred to as the "criminal media". 5. 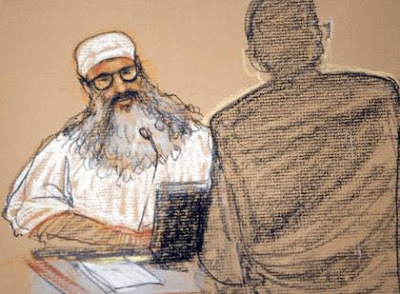 Whatever way the bombing of the Pentagon was accomplished, however, and whatever else may or may not have been done by defendants to facilitate the hijackings that day, it is clear the defendant top commanders would have had and did have, at a profound minimum, enough foreknowledge, on that day and in the intelligence information they received beforehand, to have sounded a warning in time for plaintiff and others to evacuate the building, and thereby avoid much if not all the death and injury which occurred. 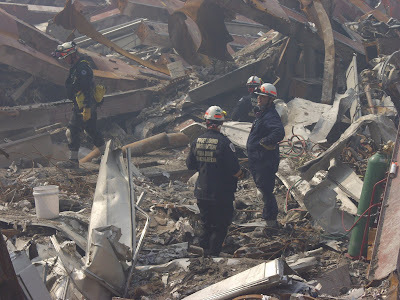 In the end, more than half an hour passed after flight controllers first sounded the alert on Flight 77, while all concerned were fully aware of the suicide crashes in New York; plenty of time for the Pentagon to be evacuated. ‘Top gun’ jet fighter-interceptors under defendants’ command, available with time to spare, were not summoned; and the people in the building, including plaintiff and her infant, were not warned. This was the result of unlawful conspiracy among these highest-level commanders, and others, who acted knowingly and intentionally to have the Pentagon attacked or to allow it to be attacked, without warning, with deliberate indifference to and in reckless and callous disregard for the fundamental constitutional and human rights of plaintiff and her child, and many other people, dead, injured and bereaved. "My position is that it's regrettable that any Americans died. And it is regrettable that they had to die, but I believe they did have to die," said Gaffney. But on a serious level, how many American lives have been sacrificed to the cause of liberating Iraq? How much money has been spent while they’re not spending their own profits from their oil? American money. So I just think it’s absolutely the act of an ingrate for them to behave in this way. Just unbelievable to me. Of course, Williams' POV is by no means unique. A point that simply can't be made enough. A recent example is on the collective yawn over the Senate report on torture, but there are abundant examples and worse examples of media criminality, such as 9/11. UPDATE: Now Cheney admits approving torture-- on national TV! Can't you just hear the uproar coming from the media?????? A pretty good duck, actually! Seriously, this is unreal. But all too fitting for Bush, I think. These objects clearly aren't tether debris, as many are coming from the wrong direction, rather than from a single direction. They are also unlikely to be random space debris or ice, given their vastly different and geometrical trajectories and also their large size. The disk-like appearance may well be due to the objects being out of focus, but these are most likely alien craft. More on the tether UFOs here (more useful for background than actual analysis). Anonymous Physicist has discussed these UFOs here, as part of the ET Quarantine around the earth-- these videos suggest there are thousands of alien crafts involved in the quarantine. How we got here, from Joseph Stiglitz. One of the bad guys: Bernard Madoff. Not that they will do anything about it. Beaming Solar Energy Down to Earth via Laser? This looks like the sort of story that would get 9/11 DEW proponents all in a tizzy. Pretty stunning disregard for workers, even by Republican standards. Note, the Republicans had to actually FILIBUSTER to block the bill! And all for what-- to allow a major industry to go BK and put the death blow on a staggering economy? Not to mention it's hard to see how this helps their party! It's pretty much going to keep them in the political wilderness for a long time, as far as I can see it. Some thoughts on the filibustering process here. Basically, is it really too much to have a party that wants to filibuster REALLY filibuster? You know, the non-stop talking filibuster-- a famous example being the one shown in the movie "Mr. Smith Goes to Washington". Slo-Mo Cheney Hit-- Luxuriate in the Fakery! So who is REALLY behind the dime-store novelty glasses, fake nose and beard? DJ Shure (Jeff Hill) interviews Purdue's "WTC1-AA11 crash" computer modeler and official shill, Mete Sozen. Sozen also modeled the "Pentagon-AA77 crash". First of all, the interview was flawed, as Hill keeps talking about the WTC2 hit when Sozen only modeled the hit on WTC1. Second, there's no way that big-time and no doubt very busy Professor Sozen would be so patient with a random non-engineer calling about this. Even if Hill said he was doing a media interview, certainly Sozen would want to check up who Hill was-- and Hill clearly is not part of the mainstream media. So at minimum, Sozen was under some kind of orders to talk to Hill for a good while. c) Sozen says he was at the Sandia F4 crash simulation, and gives some worthwhile details (none of which surprised me, but at least he clarifies a couple of things). Unfortunately, the contrast between the Sandia test and the Sozen's Pentagon crash model were not brought up. Interestingly, it turns out Sozen was involved in the FEMA OKC bombing cover-up. So Sozen has a history of involvement in government cover-ups and propaganda campaigns. Fourth, oddly, Hill says that he didn't think the US govt did 9/11-- then says he doesn't think Bush and Cheney did it. But the first statement is a surprising thing to say for a "truther". 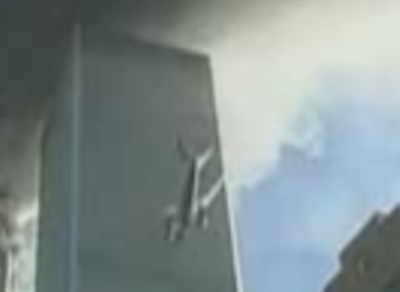 A last point is that I think it is very interesting that Sozen DIDN'T model the WTC2 hit-- when the video record for that event is at minimum an order of magnitude better. 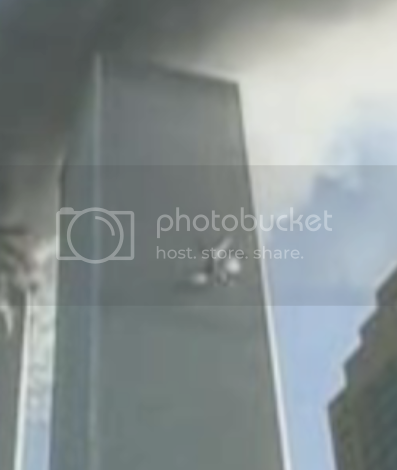 Why did he pick the WTC1 hit? Is it because the WTC2 hit is so clearly bogus and he could get away with more fudging for the WTC1, where there was less evidence? Although in any case, his simulation is a joke.